ICAI or the Institute of Chartered Accountants of India has announced the Chartered Accountants CA Final Examination 2017 Results. While, the CA CPT or Common Proficiency Test has been declared on the official website. Here we have provided direct link to download the Results for both CA CPT and CA final. The result of the Chartered Accountants Final Examination held in November 2017 and Common Proficiency Test (CPT) held in December 2017 will be declared on 17th December 2018.The merit list (candidates securing a minimum of 55% and above marks and up to the maximum of 50th Rank in the case of Final Examination according to the decision of the examinations authority will be available on the following websites. Candidates can write the exam only once and there is no chance to write the exam again for those who want to improve their scores. If candidate is already passed in the exam, they are not permitted to reappear for the exam already passed by him. Candidates who obtain minimum qualifying marks will also be issued rank certificate by examinations authority. ICAI successfully conducted the exams as per schedule and will be giving results as per dates are given below. How to Download Final Examination Results? How to CA CPT Results 2017 or for Common Proficiency Test – Result? 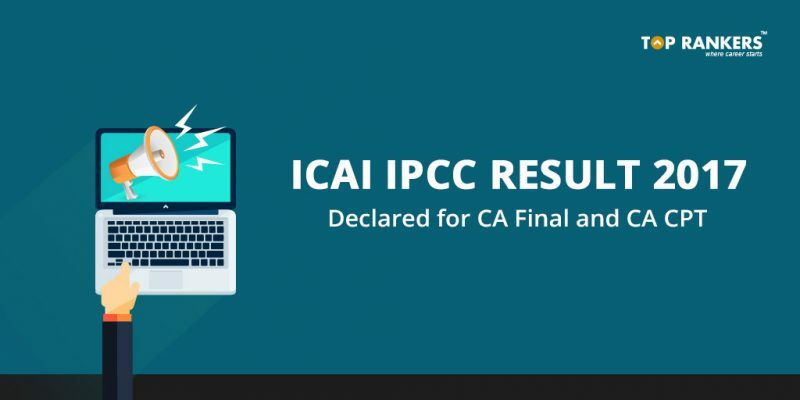 Stay tuned for more updates on ICAI IPCC Result 2017 Declared!